This salad is full of iron and has a Mediterranean taste to it. 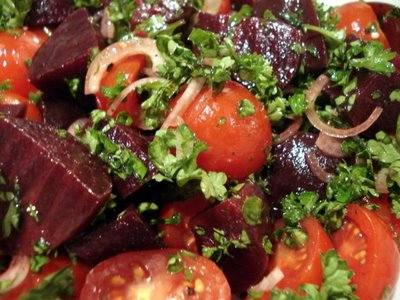 1 can beet root(cubes or slices as u desire). A good pinch of brown sugar. In a cup combine the dressing mix and keep aside. In a deep bowl combine salad ingredients together and toss well. Just before serving drizzle the dressing and give it all a good toss. Bring out on a serving platter and enjoy. Hi Rabz ,salad seems too good will try it.Thank u.